Stats: From Heaton Flat to The Bridge to Nowhere: 4.6 miles, 955′ gain, 155′ loss. From The Bridge to Nowhere to Heaton Flat: 4.6 miles, 155′ gain, 955′ loss. Round Trip: 9.2 miles, 1110′ gain and loss. Note: the canyon gets wide in many places. While the way forward is always clear, it is easy to be technically off the trail as shown on maps. As a result mileage can vary, For example, on the way to the bridge my GPS track had me at 4.7 miles. On the way back it tracked 4.5 miles. The map says 4.2 (which is probably the correct number if one makes every move along the trail as efficient as possible). 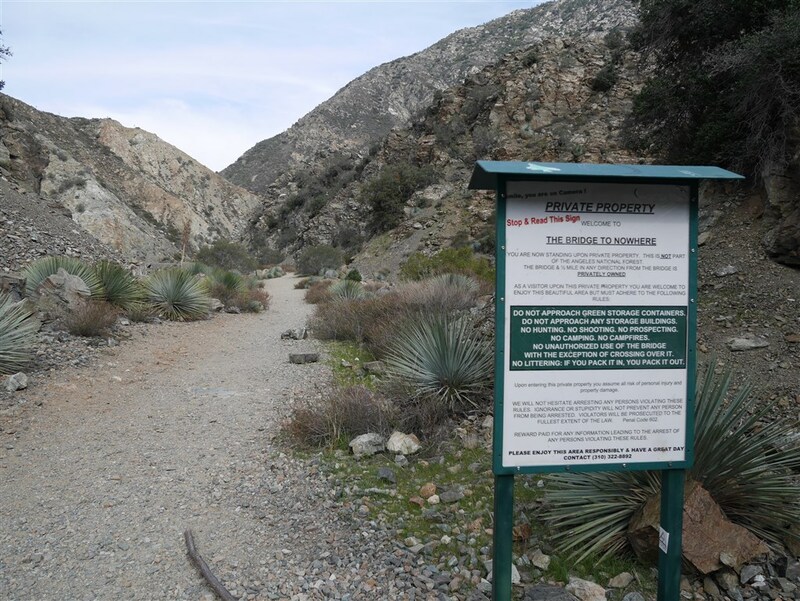 I used 4.6 (my average)–which includes walking through Heaton Flat–so that first time hikers of this trail will be prepared for a longer distance. On the more straightforward path from the parking area to Heaton Flats, the map and my GPS track both ways agreed on distance. Therefore, I think there will always be a difference based on how one makes it up and down the river. View of the trailhead after walking through Heaton Flat. See Heaton Road segment information for instructions to get to this point. 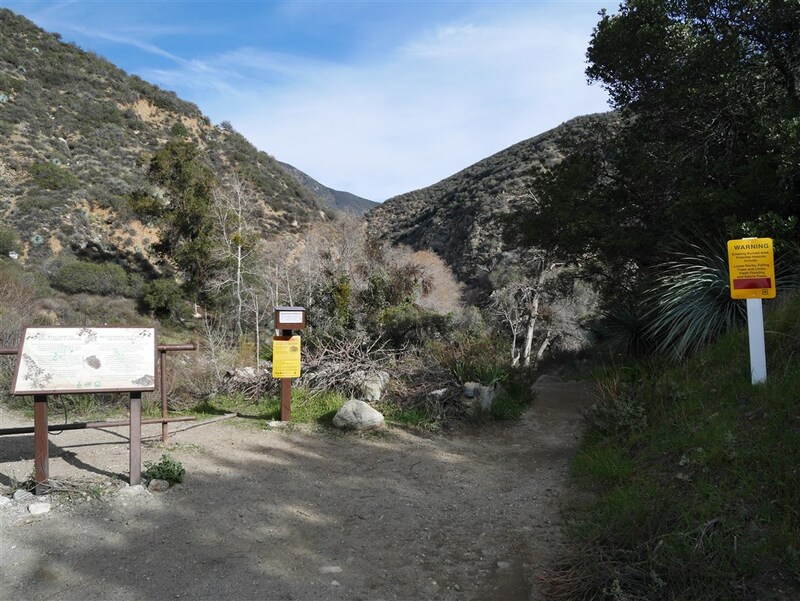 Lower San Gabriel Canyon Trailhead. 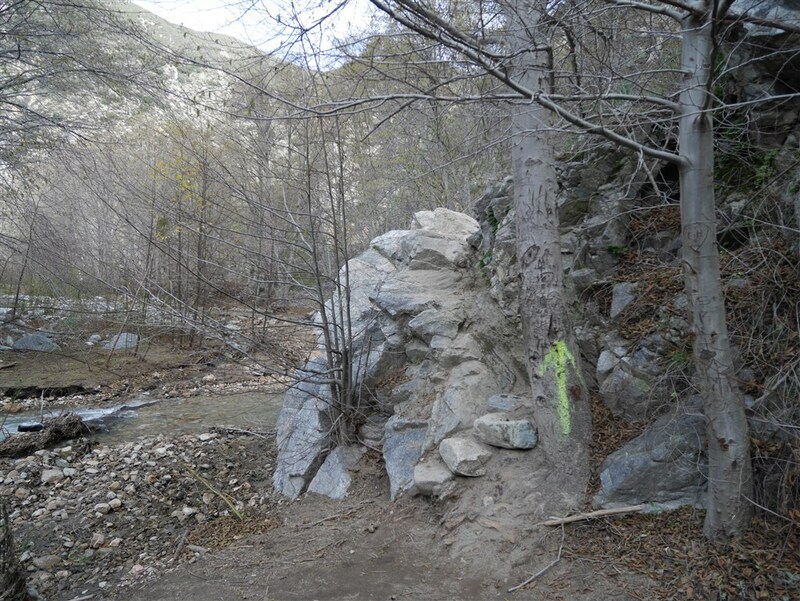 Follow the trail as it crosses the San Gabriel River several times. Obviously the stream will flow at differing levels depending on time of year etc. Be prepared to cross knee high water in some places (possibly higher if traveled after a storm), calf high water in several places. The most direct trail tends to follow a path on the right side of the stream (when heading toward The Bridge to Nowhere). At times there are trails on both sides of the river. Just embrace the fact that you will need to cross the river many times and that your feet are going to get wet and it won’t matter much which side you’re on. That said, there are two areas to look out for. First is a rocky part of the trail to climb up that is clearly marked (but in a most unfortunate manner) with a green arrow painted on a tree. Note the green arrow painted on the tree. Just climb those rocks to continue along the trail. 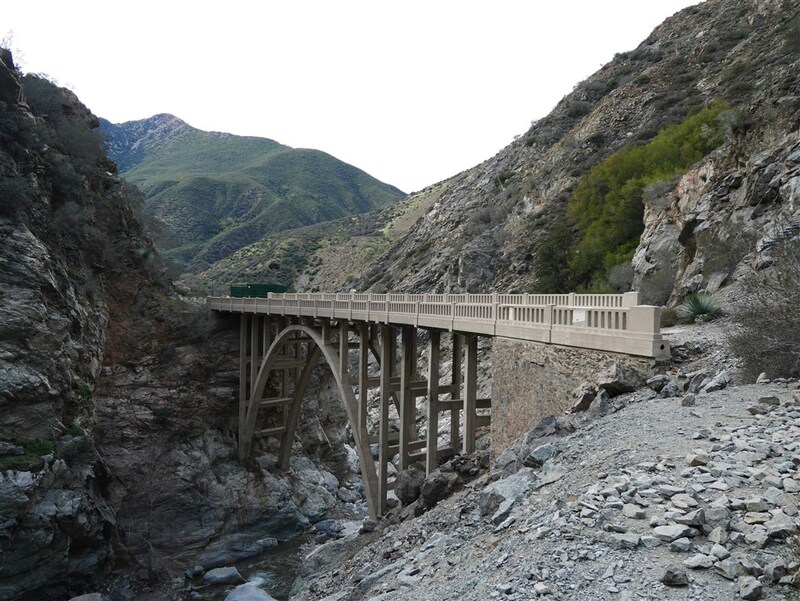 The second key area is to leave the river bed and follow a trail up to the bridge. This isn’t marked but there are several spots that one can find one’s way up. I went up one and down another and each had a different “path” through the river bed that led to them. 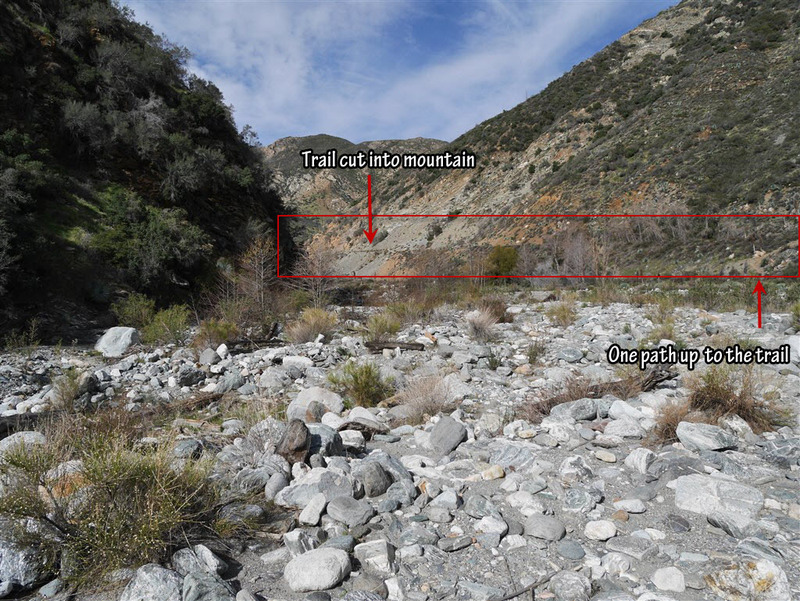 As you get around a mile from the bridge you will be walking in a wide river bed and you’ll want to look for a cut along the right side of the mountain that clearly shows there is a trail. You want to head in that direction and find one of the paths up. It’s not as difficult as that might sound to some, you just need to be on the lookout. View from where to start looking for a way up to the trail as it leaves the river bed. Close to the bridge you will cross a sign telling you that you’ve left Angeles National Forest and are on private land. Currently there’s always access, so just follow the rules on the sign (which are reasonable) and continue to the bridge. The bridge is close once you pass this sign. The trail does continue beyond the bridge, but this is a good stopping point for a nice day hike. This is also a popular spot for bungee jumping (which is run by the owner of this property). When it’s quiet though, it’s a nice place to stop at and have lunch.